VMware released two great documents!! 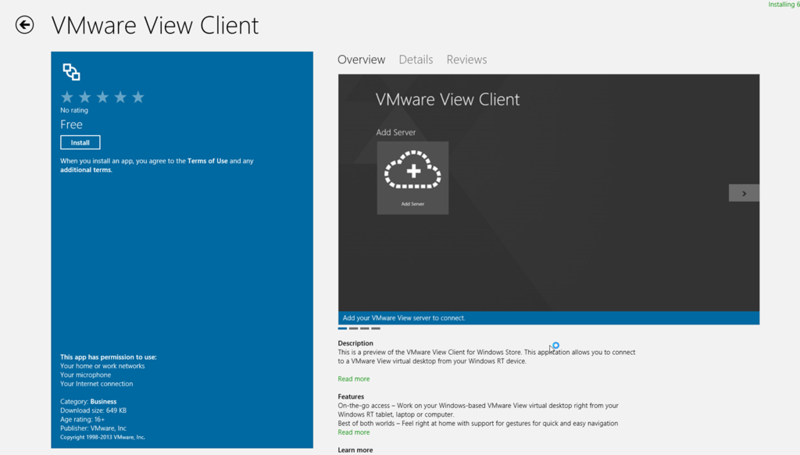 VMWare released a preview of the VMware View Client for Windows Store. This Windows Store client will run in the tiled view of Windows RT and Windows 8. VMware View XP persistent disk can not save outlook.ost c:\document and settings\…..
I’m busy with created a new a new pool with presentment disks. So, within regedit, I right-clicked on HKEY_CURRENT_USER\Software\Microsoft\Windows NT\CurrentVersion\Windows Messaging Subsystem\Profiles\Outlook then chose Export. For Save as Type, I changed the value to "Text Files (*.txt)". I then opened the text file I created with Notepad. You can’t just search for "Outlook.ost", since there are null, i.e. 00, characters stored between each character. They show up in an ASCII representation as dots. E.g. Outlook.ost would be O.u.t.l.o.o.k…o.s.t. Since the "Outlook.ost" could be broken across multiple lines, I decided just to search for o.s.t. I found the following in the text file I had created. 00000000 43 00 3a 00 5c 00 44 00 – 6f 00 63 00 75 00 6d 00 C.:.\.D.o.c.u.m. 00000010 65 00 6e 00 74 00 73 00 – 20 00 61 00 6e 00 64 00 e.n.t.s. .a.n.d. 00000020 20 00 53 00 65 00 74 00 – 74 00 69 00 6e 00 67 00 .S.e.t.t.i.n.g. 00000030 73 00 5c 00 4a 00 69 00 – 6d 00 5c 00 4c 00 6f 00 s.\.J.i.m.\.L.o. 00000040 63 00 61 00 6c 00 20 00 – 53 00 65 00 74 00 74 00 c.a.l. .S.e.t.t. 00000050 69 00 6e 00 67 00 73 00 – 5c 00 41 00 70 00 70 00 i.n.g.s.\.A.p.p. 00000060 6c 00 69 00 63 00 61 00 – 74 00 69 00 6f 00 6e 00 l.i.c.a.t.i.o.n. 00000070 20 00 44 00 61 00 74 00 – 61 00 5c 00 4d 00 69 00 .D.a.t.a.\.M.i. 00000080 63 00 72 00 6f 00 73 00 – 6f 00 66 00 74 00 5c 00 c.r.o.s.o.f.t.\. 00000090 4f 00 75 00 74 00 6c 00 – 6f 00 6f 00 6b 00 5c 00 O.u.t.l.o.o.k.\. I could also have searched in the .reg file I created when I exported the registry information from the other computer. But, again, you can’t just search for "Outlook.ost" in the .reg file you created, either, since the information in it is the hexadecimal representation of the binary data in the registry keys. You would need to convert a string, such as "ost" to hexadecimal form. You can do that at String – ASCII, HEX, Binary Converter. In the String field, I put in ost. The converter showed me the equivalent hex value is 6F 73 74. Note: the converter shows decimal/ASCII, binary, and hex values. Make sure you use the correct one. Also note that the hexadecimal representation of "OST" is not the same as "ost". Since the error message I received referred to Outlook.ost, I converted "ost" to hexadecimal. Again, it may be better to limit the length of the string to reduce the chance it will be broken across multiple lines in the file. Once you have the hexadecimal equivalent of the ASCII string, you still can’t just search for it, i.e. a search for 6F7374 wouldn’t work. The hexadecimal numbers are stored in the .reg file with commas and the null character, 00, between them. I.e., I would need to search for 6f,00,73,00,74 instead. I noticed it was associated with a "001f6610" entry. When I had searched the text file, I had also seen Outlook.ost associated with "Name: 001f6610". Posted on November 3, 2011 Categories Microsoft, Office, View, VMWareTags Converter, Microsoft, Outlook, View, VMWare, WindowsLeave a comment on VMware View XP persistent disk can not save outlook.ost c:\document and settings\…..
Building on the earlier View Client for iPad we released in March, VMware View Client for iPad 1.2 makes it easier, faster and better than ever to connect to your View desktop. With support for VMware View 5, you can get better performance with reduced bandwidth options as well as more resilient connections to your desktop than previous versions. Now with support for background multitasking, you can jump from your Windows desktop to another iPad app and then right back into the Windows desktop to where you left off! If you need to use an RSA key to authenticate to connect to your View Desktop, just activate the RSA soft token built into the View Client for iPad and you just need to enter your RSA PIN when you connect to your View desktop. That right… VMware View Client for iPad 1.2 works well with iOS 5 and takes advantage of Apple AirPlay and an available AppleTV to use your big screen TV as a display for your View desktop. While some people might think that Apple TV is just for fun, it can now blur the lines between work and play and represents the best the post-PC era has to offer. Use an external monitor or AirPlay in iOS 5 and the iPad display turns into a trackpad / keyboard while the external screen shows your View desktop! The new VMware View Client for iPad is available in the Apple App Store today! Check it out! For those of you who follow this blog and use Android based tablets. Today we are happy to release our production Android clients for Android Tablets and the Cisco Cius. After all it is about supporting the tablet you choose. Whether you are using a Samsung Galaxy Tab 8.9 or 10.1, an LG/T-mobile G-Slate, a Motorola Xoom or any of the other newly available Honeycomb-based Android tablets or the Cisco Cius, you can get the most of your View desktop on the Android tablet you choose. The VMware View Client for Android Tablets is the first Android client to support the PCoIP display protocol for best performance with VMware View 4.6 and View 5 users. With support for VMware View 5, you can get better performance with reduced bandwidth options as well as more resilient connections to your View desktop. Leveraging the power of Android multitasking, you can jump from your Windows desktop to another Android app and then right back into the Windows desktop to where you left off! The latest VMware View Client for Android is available in English, French, German, Japanese, Simplified Chinese, and Korean. When working multi-byte Asian languages, local input mode enables you to type in full lines of complete multi-byte words and then send them to your View desktop. The new VMware View Client for Android Tablets is available in the Android Marketplace and the VMware View Client for Cius will soon be available in Cisco’s AppHQ. Check them out today! Quest vWorkspace Desktop Optimizer is a free tool to optimize the virtual desktop. Blindly deploying entirely the same Windows desktop image that was used for the physical desktops is not the smartest thing to do. Running Windows in a VDI environment requires a decent amount of optimizing. This optimizing is nothing new. Quest has been optimizing SBC environments for over ten years now and many of things that we learned there (the hard way) apply equally to VDI environments. Quest created a piece of software that contains our entire ‘optimizing knowledge’ called the Quest vWorkspace Desktop Optimizer and it is Free! Although optimized for Quest vWorkspace environments, the Quest vWorkspace Desktop Optimizer will work just as well in Citrix XenDesktop or VMware View environments. You can download the Quest vWorkspace Desktop Optimizer HERE. Read HERE important information on how to use the Quest vWorkspace Desktop Optimizer. One of our MCS deployment guys in the UK – Jonathan Bennett (you may know Jonathan as the author of the autoit tools and GImageX) has developed a tool for configuring Windows 7/Windows Vista/Server 2008 images for use in a VDI environment. The tool called VDI Optimizer outputs a VBScript (based on the selections you make in the GUI interface), which can then be used to apply performance and configuration settings to images that will be deployed via VDI platforms – this is particularly useful if you are using MDT 2010 for your image engineering process as the VBScript can bolted into the task sequence using a Run Command Line task. You can make machine based selections for turning off services and functions that may not be required when the operating system is running in a VDI environment such as hibernation, system restore, and background defrag, as well as adjusting some user based settings such as visual effects, font smoothing and off-screen composition for Internet Explorer. The beta of this tool is available from http://www.autoitscript.com/files/tools/VDIOptimizer.zip but please remember The tool is provided "AS IS" with no warranties, confers no rights, and is not supported by the authors or Microsoft Corporation. 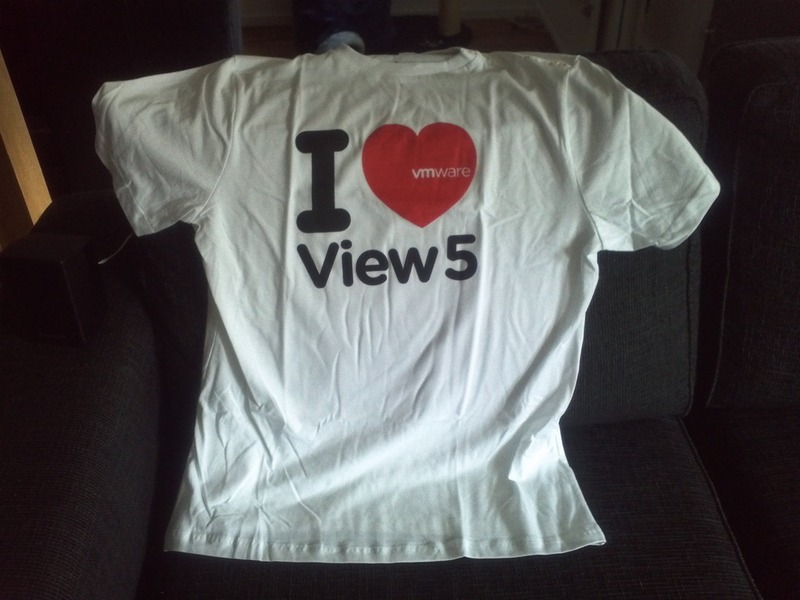 The VMware View created a funny video to celebrate the release of View 5. PCoIP WAN performance optimization – Improvements on PCoIP protocol performance in low-bandwidth WAN environments. Users who connect to their desktops over an external WAN have enhanced desktop experience. PCoIP Build-to-Lossless – PCoIP now provides the ability to turn off Build-to-Lossless. This is the feature that puts PCoIP in parity with ICA when the discussion is around bandwidth consumption. Build-to-Lossless is ON by default and included in the PCoIP protocol within VMware View. I have prepared another post specifically to discuss this feature along with other important changes to the display protocol. VMware Client Side Caching – VMware View Client (Windows Only) now implements a client side image caching to store portions of the display that were previously transmitted. Image caching reduces the amount of data that is retransmitted and improve user experience. This cache can be managed and it’s size can be modified. I have prepared an article specifically to address this feature. Provides a user profile that is independent of the virtual desktop. When a user logs into any desktop, the same profile appears. Lets you configure and manage personas entirely within View. You do not have to configure Windows roaming profiles. Expands functionality and improves performance compared to Windows roaming profiles. Minimizes login impact by downloading only the files that Windows requires, such as user registry files. Other files are copied to the local desktop when the user or an application opens them from the local profile folder. Copies recent changes in the local profile to a remote profile repository at configurable intervals, typically once every few minutes. Client certificate checking for Windows Clients – You can configure remote Windows clients to require certificate verification. Users without valid certificates are denied access to View Connection Server. Alternatively, you can use a Warn But Allow mode that supports self-signed server certificates and lets users connect to View Connection Server with certificates that have expired or are not yet valid. You can also set a No Security mode that lets users connect without certificate checking. Support for vSphere 5.0 and hardware v8 – Remote View desktops can be hardware v8 virtual machines. Hardware v8 is not supported for desktops that run in local mode.